WOW. This opaque, nearly-black wine was smooth yet charismatic from the get-go. Flavors of cassis and blackberries played nice with the pleasant but not-overbearing wood overlay of faint cedar. This was an extraordinarily rich potion that was balanced, impressive, and concentrated without bonking us on the head. The Casey Flat Ranch vineyard is planted in Bordeaux and Rhone varieties, and this wine is indeed a lovely French twist with 44% Cabernet Sauvignon, 33% Syrah, 19% Cabernet Franc, and 4% Mourvedre. Aged in 75% new French oak. I love great discoveries. I’d never heard of Casey Flat Ranch or the AVA, and if this wine is typical of the quality of wine coming from Capay Valley, I would like to hear and taste more. ABOUT THE AVA: In Yolo County, just across the border from Napa Valley, sits the secluded and little-known Capay Valley. It was established as an AVA in 2002. Originally part of the Berryessa Spanish land grant, the area was settled in the 1850s during the California Gold Rush. Vines were planted a decade later, making it one of the pioneer winegrowing regions in California. Today, the Capay Valley has less than 100 acres planted in vineyards. 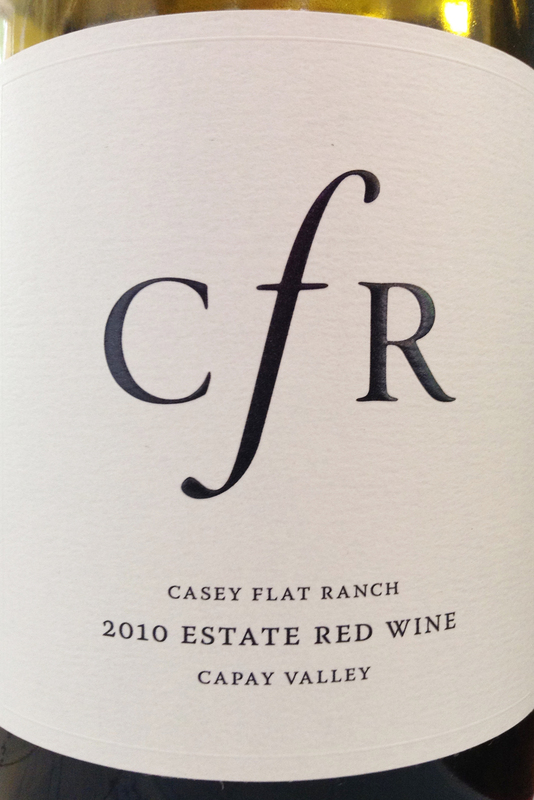 LABEL: Nestled deep within the rugged coastal mountains of Northern California sits the 6,000-acre Casey Flat Ranch, home to CFR Estate wines. Sheltered high above the Capay Valley at a 2,000-foot elevation, our 24-acre vineyard produces fruit of exceptional quality and character. Our CFR Estate Red Wine is a thoughtfully blended, distinctively authentic expression of the land and the winemaker’s art. This entry was posted in Cabernet Franc, Cabernet Sauvignon, California, Mourvedre, Red Blend, Syrah/Shiraz. Bookmark the permalink.